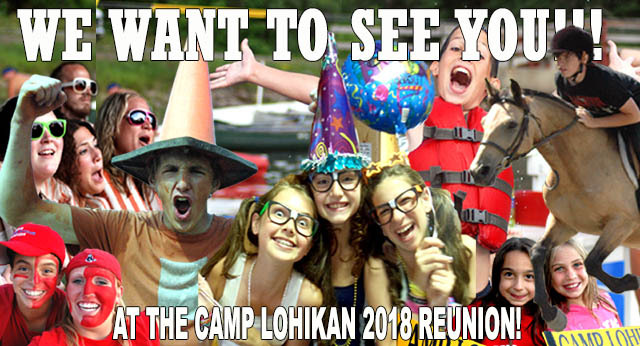 Get Ready for the Camp Lohikan Winter Reunion! Our winter reunion is all set, and you're invited! WHO: Campers and staff who attended Camp Lohikan last summer, their parents and siblings. WHAT: It's the Winter Camp Reunion! WHERE: Space in Bergen County, New Jersey. Space is located at 491 South Dean Street, Englewood, NJ 07631. WHEN: Saturday, January 5th from 12:00pm to 3:00pm. Please note that the new time; the time is now in the afternoon in 2019. 1. Do I have to register for the winter reunion? Yes. There is a capacity limit at the Space that we can't exceed. Registration for the reunion is therefore required. A registration form is available by clicking here. Please submit your completed registration form to Camp Lohikan's winter office by Wednesday, January 2, 2019. Yes, absolutely. We love siblings! However, please note that if a sibling is brought to the reunion, the parent must remain at Space in order to provide supervision. There’s a parent lounge at the Space and we’ll have coffee, donuts and bagels available. 3. Are parents required to stay at the reunion with their children? No. Parents are only required to stay if there are non-campers (i.e., siblings) in their party. LOOKING FOR SOMETHING TO DO NEARBY WHILE YOUR CHILD IS AT THE REUNION? Parents are not required to stay at the reunion. Once you check your child in, you may wish to head up the road to the Riverside Square Mall in Hackensack which is about 4 miles from the Space. Don't forget that the reunion ends at 3:00pm! 4. What happens at the reunion? Camp Lohikan has arranged for our campers to have exclusive use of Space from 12:00pm to 3:00pm. Only invited Lohikan staff members, campers, siblings and parents will be permitted to enter Space so it’s a safe and secure environment. Camp Lohikan will provide each camper with a complimentary game card. The game card can be used for a for UNLIMITED video game play in the arcade rooms, unlimited free access to Laser-Tag and Glow-in-the-Dark Bowling. Non-camper siblings will not receive a separate video game card but instead will be asked to share the video card issued to their "camper" sibling. This also applies to parents. Refreshments (juice, bottled water) and bagels will be provided for everyone. 12:00pm - Winter Reunion begins. You can arrive anytime after 12pm. 12:00pm - Refreshments (juice, bottled water, coffee) and bagels will be provided for everyone. 12:00pm-3:00pm - Lohikan campers have exclusive use of Space. This includes Glow-in-the-Dark Bowling, Arcade Room, and more. 12:30-2:45pm - 2018 Summer Slide Shows and Summer Videos! 3:00pm - Winter Reunion ends. 5. Tell me more about Space. Space is a huge indoor Family Entertainment Center. It’s loaded with 26,000 square feet of entertainment that includes hundreds of amusing games and recreational sports. The Arcade Room includes tons of the newest and coolest video games. Thunder Bowl is a really cool Glow-in-the-Dark Bowling Alley. Space is without a doubt a great entertainment venue offering exciting games and attractions, but the best part of the reunion event will be… YOU! So you better be there!!! 6. What are the reunion rules? And what about supervision? All camp rules from the summer apply at the reunion except the cell phone and camera/camcorder rules which is discussed below. Lohikan staff members will be providing supervision to the campers while they remain inside the Space building. We’ll be on duty from 12:00pm to 3:00pm. Parents are welcome (and encouraged!) to attend and partake in all of the festivities, however your attendance is not mandatory (unless a non-camper sibling is in attendance). Parents: Please instruct your campers not to leave the Space building without you or an adult you have authorized. All of the exit doors cannot be staffed to prohibit a participant from leaving the premises. If there is a concern as to if the camper will leave the building unsupervised, the parent must attend the reunion. 7. Can I bring a cell phone or a camera to the reunion? Yes! The camp rule prohibiting cell phones and digital cameras and camcorders is suspended at the reunion. If you don't have a camera, don't worry. We'll be taking a lot of photos at the reunion and we'll post them online in the summer gallery section of the camp's website. We look forward to seeing you at this year's reunion. If you have any questions, or need more information, feel free to contact us at our winter office at (908) 470-9317. Click here for Lohikan's reunion registration form. Click here for more information about Space. Click here for driving directions to Space. Click here to complete our Camper Questionnaire.......... Click here to complete our Parent Questionnaire.